The EU Intellectual Property Office (EUIPO) has released a new report, compiling research since 2013, to present a comprehensive and updated picture of the scope and impact of IP rights (IPR) infringement in the EU. In particular, it emphasises the value of IP rights for EU economies and firms, the increasing sophistication and diversification of counterfeiters, and the impact of IPR infringement to the EU. Released yesterday, the “synthesis” report collates research conducted by the EUIPO’s EU Observatory, in conjunction with the Organisation for Economic Co-operation and Development, over the last five years. Below we summarise the key findings since 2013 as presented in the study. In its examination of IPR-intensive industries, the report notes that these contribute 42% of total European GDP and 28% of employment, representing an increase since initial 2013 estimates. Trademarks represented the highest share of total EU economic activity at over 35% (see graph below). In a similar vein, it was found that sectors that utilised IP assets more showed a collective trade surplus with countries outside of the EU. From its 2015 report analysing the relationship between the ownership of IP assets and firm performance, the EUIPO revealed that IPR-owning firms generally performed better than companies that did not own IPRs – the former’s revenue per employee was on average 29% higher than that of firms without IPRs. This difference was most pronounced with designs (31%), followed closely by trademarks (29%). Digging deeper into the relationship between IPR-ownership and financial performance, it was also shown that a 10% increase in EU trademarks resulted in a rise of 2.8% in revenue per employee, while a 10% increase in national trademarks led to a rise of 5.2%. Interestingly, this effect was especially noticeable for SMEs; yet, at the same time, IPR ownership among European SMEs was particularly low – while 40% of large EU firms have registered IP rights, the same is true for only 9% of SMEs. Further research on the topic has confirmed that the majority of European SMEs believe IPRs have a positive impact on their business – those that owned IPRs were far more likely to indicate that this has a positive impact on their turnover, employment and profitability. However, many SMEs lack a depth of understanding around IP and believe both the registration and enforcement processes to be too lengthy and expensive. Moving on to the scale of IPR infringement in the EU, the report delivers an updated snapshot of the counterfeiting landscape. From its research over the last five years, the EUIPO has found that counterfeiting practices continue to get more diverse and problematic. Although originally centred around luxury and branded goods, counterfeiting has now spread to virtually every product with a brand that possesses value due to cheaper and more sophisticated production methods. Additionally, infringers are making greater use of small packages, as opposed to bulk transportation, and the shipping of non-labelled products (with labels to be attached at a later stage) to evade detection. Meanwhile, the report warns that new transport links (such as the growing rail network between the EU and China) could lead to further diversification in their approach. 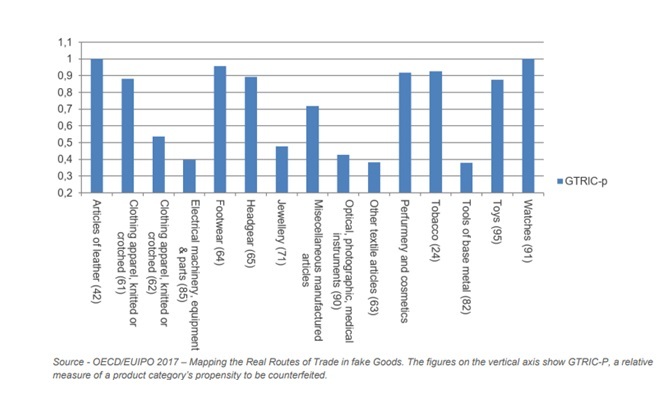 The EUIPO attributes the mounting problem of fake goods principally to the fact that the potential return on investment is higher than that of other crimes, while risks are also lower. In comparison to the sale of illicit drugs, for example, returns are much higher but prison sentences and fines are significantly lower. Moreover, the Internet and e-commerce has further exacerbated the problem by aiding the sale and distribution of fake goods and illegal digital content. Earlier research placed an estimate on advertisement revenue raised by infringement websites at €5.3 million per site annually. 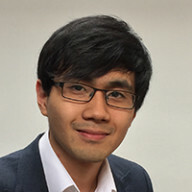 Worryingly, in its analysis of 1,400 web pages, the same study identified over 1,500 unique brands on suspected infringing websites, with 46 of the top 100 global companies having at least one brand advertised on an infringing website. From its two IP perception studies, conducted in 2015 and 2017, the EUIPO discovered that what drives the demand for illicit goods and digital content from a consumer perspective are the lower prices, ease of access and high level of social acceptability. In particular, a large proportion of young people (41%) believed that “it is acceptable to purchase counterfeit products when the price for the original and authentic product is too high”. From the same age group, 43% also agreed that it was permissible to download content illegally from the internet when there is no immediately available legal alternative. Turning to the economic impact IPR infringement in the EU, it was estimated in a 2016 report that the total value of counterfeit goods in global trade as of 2013 had reached €338 billion. In the EU, total imports of counterfeit and pirated products were calculated to be as much as €85 billion in 2013, representing roughly 5% of total imports into the region. As part of a series of additional sectoral-specific studies, it was estimated that the direct economic costs of counterfeits to the EU marketplace amounted to nearly €59 billion annually in lost sales, corresponding to around 435,000 jobs. 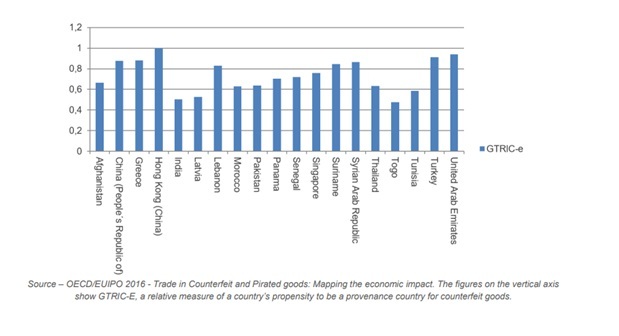 The above 2016 report also identified the 20 most prevalent provenance economies of counterfeit goods entering the EU, as seen in the graph below. A further analysis was conducted in 2017 to better understand which of these countries were major producers of fake goods and which were simply transit points for onward shipments. Ten industries were revealed to be particularly susceptible to counterfeiting and, unsurprisingly, China was identified as the top producer of fakes in nine of these sectors. India, Turkey, Thailand, Malaysia and Pakistan were also found to be major sources of fake products. On the other hand, Hong Kong, the United Arab Emirates and Singapore were revealed to be key global transit points where large packages of counterfeit goods arrived to be further distributed in smaller shipments. On a regional level, the Middle East is an important transit point for Africa; Albania, Morocco and Ukraine are highlighted for shipments into the EU; and Panama is singled out as a top transit point for fakes destined for the United States. The top industries most likely to suffer from counterfeit EU imports can be seen below. Although it is emphasised that counterfeiters are now prepared to infringe on branded goods across practically all industries, imitation goods continue to be particularly prevalent for watches, toys, leather goods, handbags, footwear, tobacco, perfumes and jewellery. While reflecting on previous studies, the new report provides an important overview of the IP landscape and concludes with the actions being taken by the EUIPO, and various other organisations, to combat the ever-growing problem of IPR infringement and of counterfeits in particular. It stresses that, despite these efforts, the current approach still needs to be strengthened, especially from a co-ordinated cross-border perspective between Member States and different organisations and agencies. The EUIPO’s research efforts thus far will surely continue to be critical in this regard, as it helps to paint a clearer picture on where things stand concerning IPR infringement in the EU.